Posted on January 13, 2011	by Lou Murray, Ph.D.
Wow, it’s been a bit over a month since I did a blog post. When I get out of the habit, I really slip. Things got busy over Christmas, and we were away for the holidays. I’m just now getting back into the swing of things. To tell the truth, the real problem is that our son Scott gave us a 47″ flat screen Vizio TV for Christmas and I bought a Vizio home theater sound system to go with it. I also bought a Wii Fitness Plus. I have been in front of that TV for almost all my waking hours, either playing with the Wii or watching movies. The picture and sound are AWESOME and I can’t tear myself away. One of my New Years resolutions is to become more fit this year, and using the Wii for 90 minutes a day has eaten up a lot of my “play time.” Well, here is a start at getting back into the routine of blogging. 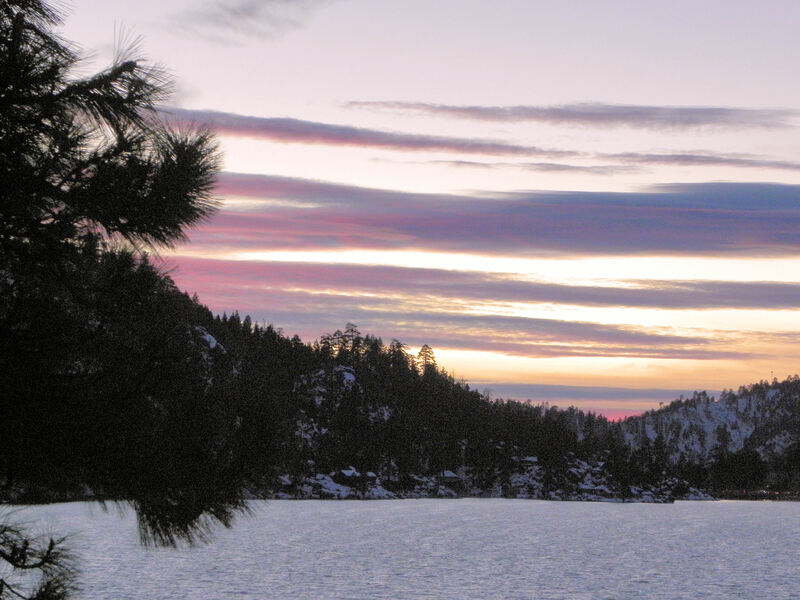 We went to Big Bear, CA for Christmas, renting a fabulous house on Big Bear Lake with our son Scott and his family. We had a great time. The little granddaughters are so cute. We just love them to pieces. Here’s a photo recap of our vacation. 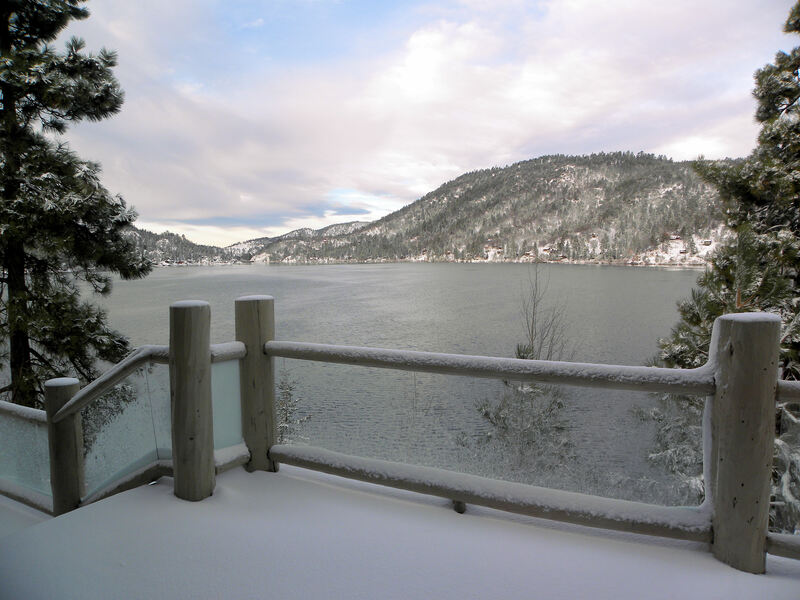 We had a great view of Big Bear Lake from the house and surrounding deck. We cooked all of our meals in this wonderful kitchen with granite countertops. Sure wish I had a kitchen at home this nice. The house featured this nice deck outdoors with covered dining and even a fireplace, but it was too cold to eat outside. Scott did use the grill one night to bbq steaks. The house appeared to be professionally decorated in "mountain chic." Many of the furniture pieces were works of art. The little girls loved running up and down the stairs from the main level to the loft, where there was extra sleeping if we had needed it. This is a view of the living room from the loft. We kept a fire going in the fireplace all day long for our white Christmas in Big Bear. Megan loved watching her Daddy light the fire and wanted to help by carrying over more logs to put on the fire. I parked myself in a chair by the fire and read most of the day. Very relaxing. 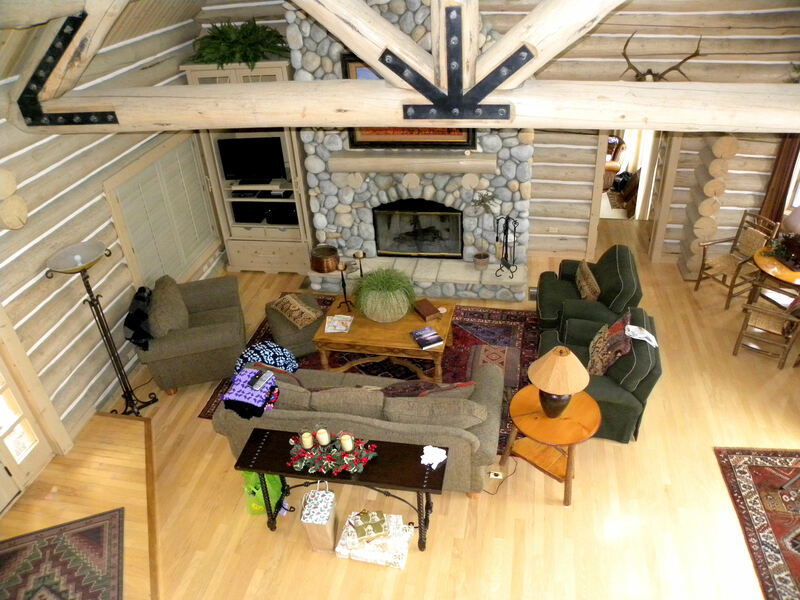 The lower level was the game room with fireplace and view of the lake from the deck. Megan was fascinated by the decorations on the tree. 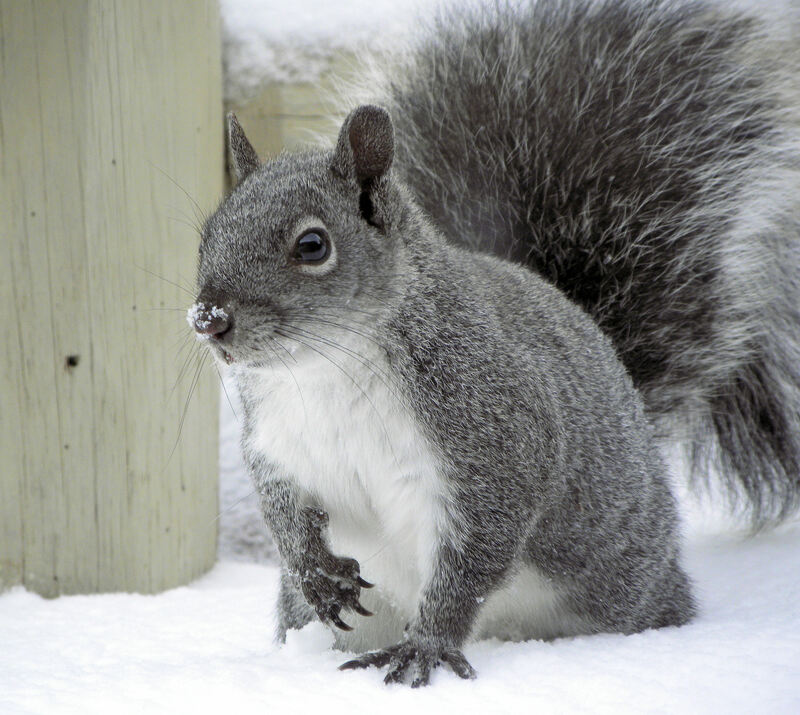 We fed peanuts to the gray squirrels and Stellars jays that visited the deck. Oh, look, Nicole got both a Nintendo Wii and an X-Box Kinect. 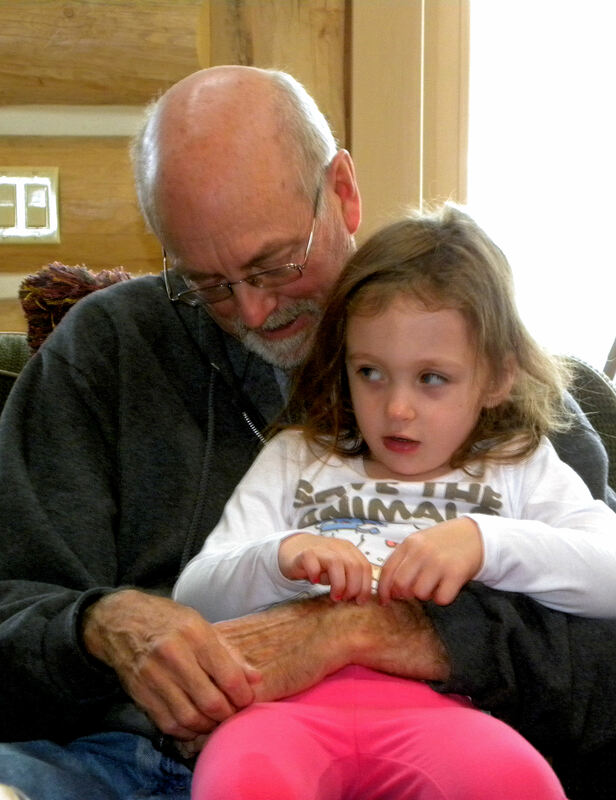 We had some quality time with the grandkids. Vic helped Lauren work her new puzzle, while Nicole's mother Maria helped Allison. I sat in the middle and helped on both puzzles. The girls tired quickly of the puzzles, which were a bit hard for them, and soon it was just grandparents on the floor with the puzzles! Funny. The bedroom that we used was beautifully decorated. The bedroom had a loft, a door to the deck with a lake view, and skylights. We could see the stars at night through the skylight. Daytime was for snow play. We went to a park in Big Bear, where the girls enjoyed sledding. Scott, Nicole, Megan, and the twins, Allison and Lauren. We showed the girls how to have a snowball fight. Their Papa Vic was their favorite target. The twins did a "run and throw" frontal assault, while Megan attacked from the rear. Poor Vic. But I don't think he suffered too badly. After a day of playing in the snow, the little girls went down for naps while this big girl headed for the hot tub. Delightful. The twins turned five while we were in Big Bear. Allie loved her big cupcake. Megan's birthday was several days later, but I let her open the gift from us while we were there. It was a sleeping bag, which her mother said she wanted. When she opened it, she squealed with delight, "It's just what I always wanted my whole life." All three years of it. A storm was forecast to move in our last day there, arriving around 3 am. Not wanting to drive down mountain roads while it was snowing, we decided to leave that night and avoid the storm. Good decision. Scott has 4WD and chains, but even they left at 6 am to avoid the worst of the storm. Great vacation. I hope you enjoyed sharing our Christmas vacation in Big Bear with us. One of these days I’ll get back to gardening. This entry was posted in Uncategorized and tagged Big Bear, Big Bear Lake, Christmas, family, photos. Bookmark the permalink. I can see why you had no time for blogging! Looks like you had a fabulous holiday. I considered the Wii Fit, and almost hit up Santa for one. How do you like it, is it something you think you’ll stick with? Clare, I find the Wii positively addicting. I love it. Not sure that the little cartoon characters would appeal to everyone, but I am challenged by the games and always want to top my score, which is improving my balance and fitness at the same time. I suspect that I will be able to keep with it, but only time will tell as I HATE exercise. This just doesn’t seem like exercise though. More like fun. Robin, we southern Californians really are spoiled, aren’t we? We can have a morning at the beach and be playing in snow in the mountains by afternoon.